It’s about time this Jonas Blixt guy got some attention. After his win at the Greenbrier last week he now has two PGA Tour victories since last October and more wins than his fellow Puma Golf ambassador, Rickie Fowler. The victory also earned him a spot in the Open Championship (sure beats sitting on the couch). 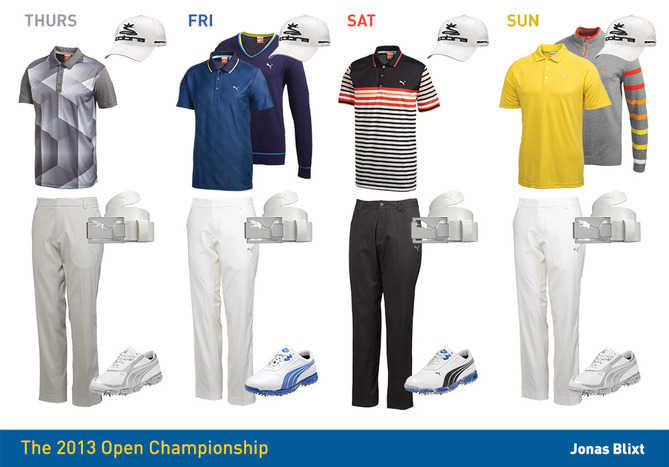 Kudos to the team at Puma Golf for putting together an Open Championship script for Blixt at the last minute in response to his victory, and for including some outerwear selections, which many brands seem to have ignored. Orange may be the go-to color for Rickie Fowler on Sunday’s, but it appears Jonas Blixt has settled on yellow (undoubtedly a tribute to his home country of Sweden). He’ll rock the same yellow shirt/white pants look for the final round of the Open Championship as he did at the Greenbrier. Let’s hope it’s warm for the final round because I have doubts about the scripted sweater (grey with red, orange, yellow and white stripes on the sleeve). The rest of the week he’ll don a variety of fresh new colors and bold patterns from Puma’s Fall/Winter 2013 Collection. Coordinating AMP Cell Fusion shoes will complete his look everyday. As with his U.S. Open, Rickie Fowler’s Open Championship is being presented with StyleCaddie, Puma Golf’s virtual dressing room app. Yes, Rickie will be sporting a lot of orange on Sunday and even some on Saturday. From a pattern standpoint, he’ll be wearing a little bit of everything–we’re talking plaids, stripes, solids and houndstooth. Thursday’s and Friday’s outfits are the most intriguing. The slim-fitting 5 Pocket Plaid Tech pants will bring some funk to the opening round. Friday’s script may look like a basic blue shirt paired with white pants, but on closer examination the New Wave polo features an all-over tonal houndstooth print (a good example of how Puma Golf is putting a fresh spin on classic patterns). Fowler will also wear the New Wave Snapback hat on Friday that includes the same tonal houndstooth pattern on the front panels. 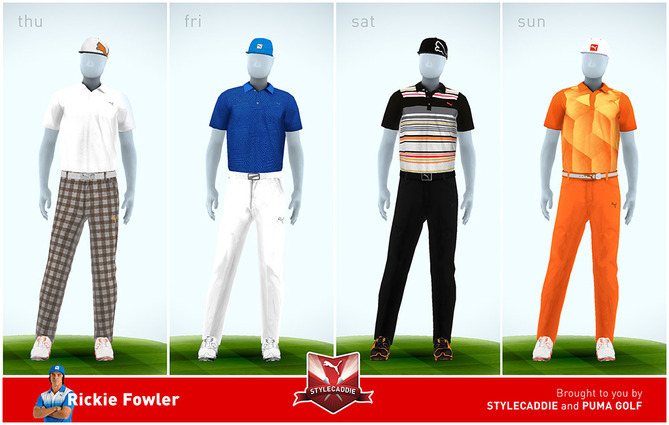 Like Blixt, Fowler will complete his look everyday with matching AMP Cell fusion shoes. Check out the complete Open Championship scripts below for Rickie Fowler and Jonas Blixt.